Are you getting everything you need for health and vitality? My recipe for quinoa can be enjoyed hot or cold. It makes a wonderful base for a lunchbox salad: Try it mixed with grated carrots, olives and salad leaves. It is also excellent with oven roasted vegetables. The Incas referred to quinoa as the mother of all grains, and it certainly packs a nutritional punch! 1 portion (250ml/185g) of plain cooked quinoa provides approximately 5 grams (g) of fibre, 8g of protein and only 300 Kcal. In addition, for an average women, a portion provides 15% of daily iron requirements, 30% magnesium, 13% zinc, 100% B1, B2, and B6, 20% folate, 60% Vitamin E and is a good source of lutein & Zeaxanthin…Wow! Add spices and sugar to warm oil to release fragrance. Do not burn or fry on a high heat. Add stock. Turn up heat and bring to the boil. Bring back to the boil. Stir well and simmer for 15 minutes with the lid on followed by a 10 minute simmer without the lid, until all the moisture has evaporated. High in fibre. A good source of iron, vitamin C and folic acid. Preparation takes 15 minutes. Cooks for 1 hour in the oven or slow cooker. Wonderful served on a slice of toast and sprinkled with fresh parsley, but also great at room temperature as a side dish. 1) Heat the oven to 110oC fan or pre-heat the slow cooker on high. 2) Gently heat the oil in a large saucepan and tip in the onion and garlic. Cook slowly for about 10 minutes until the onions are soft but not browned. 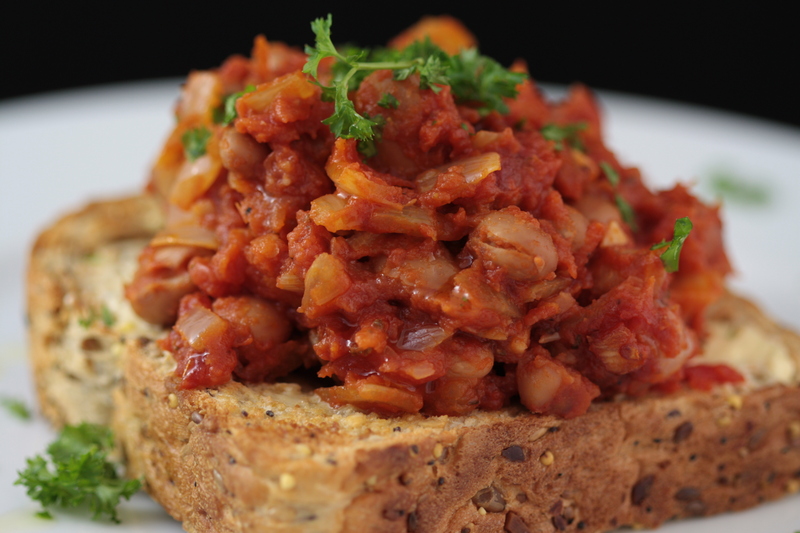 5) Add the drained beans to the tomato sauce, give them a good stir and bring the sauce back up to a gentle simmer. 6) When piping hot…Tip the beans and sauce mix into an oven proof dish (cover with a lid or some foil) or cook in the slow cooker for approximately 1 hour. Note- cook for longer in the slow cooker for convenience, turn to the ‘low’ setting and maintain moisture levels with a top up of a little boiling water if necessary. 7) when ready to serve allow to cool for a few minutes, scatter with fresh parsley and perhaps a little drizzle of extra virgin olive oil. Easy to prepare, cooked in a slow cooker and then satisfyingly quick to serve with little washing-up. I have experimented with different recipes to find a balance of herbs and spices that I love. Lean lamb steaks work well. Alternatively, use a whole joint, bones and all, for extra flavour and easy preparation. Tip- Prepare on Saturday morning for a perfect Saturday night dish. 1) Preheat the slow cooker on High heat for 20 minutes. Trim any obvious large pieces of fat from the meat. 2) Heat a frying pan until it is nice and hot then seal the meat quickly on all sides and place in the crock pot. 3) Add the onion, ginger and garlic to the frying pan and turn down the heat a little to soften without burning for a couple of minutes. 4) Add the spices and pepper to the pan with the onion mix and cook the spices gently for 1 minute. 5) Add a little of the hot stock to the pan and stir well, scrape any residue from the bottom of the pan. Bring to the boil. Then add the rest of the stock and return to the boil. 7) Carefully pour the sauce into the crock pot over the meat. 9) The meat must be covered by liquid so, if necessary, boil a kettle of water and top up the liquid level in the crock pot with the boiling water. 10) Replace the lid on the crock pot and cook for about 6 hours on high for the first half hour then reduce to low for 5-6 hours. If using the large lamb joint: leave the crock pot on high for the full cooking time. At least 6 hours. 11) After this time check that the lamb is cooked and nicely tender. Remove the meat and vegetables from the crock pot, using a slotted spoon, and set aside for a moment. keep warm. If using a large lamb joint: place on a meat dish. The meat should fall off the bone easily. Discard any bones, gristle, fat and skin. Retain the luscious chunks of meat and chop into smaller pieces if necessary. 12) Place a metal sieve over a large saucepan and sieve the sauce from the crock pot into the saucepan. Remove the bay leaf and thyme and cinnamon stick. Tip the onions and prunes etc back into the crock pot with the chunks of lamb meat and replace the lid to keep warm. 13) If using a large lamb joint instead of lean lamb pieces: Give the sauce 5 minutes to settle and then, using a large metal spoon, skim off as much of the fat layer from the surface as you can, and discard. 14) Poor the sauce into a pan and bring to the boil. Remove the lid and simmer the sauce for approximately 20 minutes to reduce the sauce by about 1/3. 15) At the end of the 20 minutes mix the cornflour with a little water in a teacup and then add in one go to the boiling sauce and stir well to prevent any lumps from forming. If you need a thicker sauce repeat the process. Cook for a few minutes. Taste the sauce to check the seasoning. You may wish to add a large pinch of sea salt. 16) Add the sauce to the crockpot. 17) Give the Tagine a gentle stir to mix everything together and replace the lid. It is now ready to serve. 18) Serve with cooked, plain couscous or rice and a sprinkle of fresh parsley. A tasty way to invite some beneficial microbes into your digestive system! Add to sandwiches, as a side with ham and other cooked meats or with a cheesy jacket potato. Homemade sauerkraut will help to provide your digestive system with beneficial gut microbes and is also a good source of vitamin B12. However, I do not recommend fermented foods if you have low stomach acid, food intolerances or regularly take anti-histamines or antacids. If this describes you then I recommend that you enjoy fresh, raw salads and lightly cooked vegetables instead of fermented foods. You will need clean pickle jars (this recipe makes approximately 1 litre of sauerkraut) and a food processor is useful to finely chop the cabbage, but is not essential. 3) Pour the salt solution over the vegetables. (Top up with extra boiled and cooled water if the veg isn’t quite covered). 4) Wash your hands well (and scrub your nails if necessary!!) and then massage the vegetables for a few minutes to ensure that everything in the bowl has made contact with the salt. 5) Cover with a plate and set aside at room temperature. Leave overnight. 6) Make sure all your utensils and pickle jars are scrupulously clean because any nasty bugs that are present will destroy your sauerkraut during the fermentation process. (Pickle jars should either be sterilized with a Milton type solution and rinsed well or washed in very hot soapy water and placed in a 100oC oven to dry). 7) Drain the vegetables, reserving the liquid. 8) Stir through the prepared garlic, ginger, dill and fennel seeds and mix well. 13) Leave the jars in a dark, cool (but not cold) place. Perhaps a garage? Consume within approximately 2 months of making. (Note- when you open the lid it should smell sweet and fruity with a hint of cabbage. If it smells bad then the fermentation process has failed and the contents should be discarded). 15) Store open jars in the fridge and consume within a couple of weeks. *Adapted from: The Functional Nutrition Cookbook, (2013), by Lorraine Nicolle and Christine Bailey, printed by ‘Singing Dragon’, London. Dairy Free. Gluten free. Healthy. A source of Calcium, magnesium, potassium, iron and zinc. Frozen Edamame Beans, 80g per person. Ingredients for the dressing (serves 3). Cook the frozen edamame beans in a pan of boiling water according to the packet instructions. This usually takes 7 minutes. Drain the beans in a colander. Cool down the beans quickly by running water from the cold tap over them. Put to one side on the drainer to drain the excess water. Combine the cooked edamame, noodles, chopped onion, grated carrot and dressing in a large bowl. Transfer to the fridge until required. Serve with a sprinkle of your choice of fresh herb: chopped fresh mint/coriander/basil leaf and extra soy sauce/sesame oil/sweet chilli sauce. Enjoy on its own as a light lunch or snack. Delicious served with chilli and lime prawns. Chocolate cup cakes. Delicious. Dairy Free and Gluten Free. Dairy free & Gluten free. Health warning: Only intended as a treat!! 4 Eggs, free range, large, beaten. A few twists of the sea salt mill. Set the oven to Fan 180oC/200oC conventional/ Gas 6. Put the large muffin cases in a muffin tin. Gently combine the flour and the cocoa. In a separate bowl beat together the butter and sugar until lighter in colour and no longer ‘grainy’. Add half the beaten eggs and 1 tablespoon of the flour + cocoa mix to the butter and sugar mixture. Combine well using a low speed on the electric mixer or with a spoon. Repeat step 5) with the rest of the egg. Using a fine sieve add the remainder of the flour + cocoa to the cake mixture and gently combine using the low setting on the electric mixer. Add the soya milk and gently mix until combined. Half fill the waiting muffin cases. Approximately 60ml (¼ cup) to each muffin case. Leave to completely cool (about 1 hour) before adding the icing to the top of the cakes. Measure the spread or butter into a bowl. Gently combine the cocoa into the icing sugar with a spoon. Sieve the icing sugar + Cocoa mixture into the butter add a few twists of the seasalt mill and then combine well with an electric mixer or by hand. Transfer to the fridge to ‘firm up’ while the cakes cool. Add a generous dollop to each cake and enjoy or cover and Keep in the fridge for a few days. Quick and nutritious. Dairy free. Meat free. Gluten free. 1) Warm the oil in a large frying pan or saucepan. 3) Stir well to combine and fry gently for a few minutes over a low heat without burning. 4) Add the tomatoes and turn up the heat. Combine well and bring to a brisk simmer, stirring to prevent the mixture burning. Gently simmer for 10 minutes, uncovered. 6) Add the sliced mushrooms and stir well to combine. 7) Add 800ml boiling water and mix well. Bring back to a rapid simmer and reduce heat. Cook gently, uncovered for 20 minutes stirring occasionally. 8) Serve with boiled rice, quinoa, pittas or chappattis. It is also great served on its own. Keep leftovers in the fridge for a few days. Eat cold straight from the fridge, or in a wrap, or reheat thoroughly if preferred hot.